We are finally moving beyond a very challenging global transition which started in 2016 with a global 9 year, which is a year of ending and completion. 2017 was supposed to bring in new clarity and new beginnings, but it was a slow start because the energy of the 9 year can hold us back. Now in 2018 we are fully free to move into more enlightenment and create new things in our life and business with the help of spiritual connection. Globally 2018 has the energy of discovering new connections to spirituality and bringing heaven to the earth in new and creative ways. The energy of each year has a global effect on everyone. However, each individual also has their own personal year number that is influencing the energy flow of their life and business that year. Let’s look at the global energy of 2018, learn how to calculate your personal year numbers and explore the personal year number and how that is effected by the global year energy. As a global 11 year, 2018 is about deepening our spiritual connection and expressing heaven on earth through our presence. “Spiritual” or “Heaven“ refers to the things that we do not understand physically; they are beyond the physical. For some, spiritual connection is going to church or spending time with a spiritual teacher, and for others it can mean a walk in nature or, like in Hawaii, surfing waves. There are many ways to find spiritual connection and it is up to each person to discover the best way to connect. Regardless of how you connect spiritually, 2018 is the year to explore and deepen the connection. You might find new insights into the self, new creative ideas to share with the world, or express the spiritual side of your soul in new ways. Ask the question, “how do I express the divine in the physical world, and how can I help others connect to the divine inside themselves?” In general, people will be looking for new spiritual experiences and wiling to explore the non-physical. Businesses and activities that are helping people connect more spiritually should see a rise in popularity in 2018. The 11 of the 2018 can also be about deepening the connection to self and others. The two 1s can be a symbol for the individual connecting to their soul or two individuals coming together as one. In 2018 you may find it important to take a spiritual journey or connect with yourself in new ways and discover those parts of your soul that were hidden or mysterious. 2018 is a year for finding a soul mate or connect with others one-on-one. It might also be a good year to find a spiritual teacher who can guide you into new ways of connecting to the diving inside yourself. Understanding your personal year number and how it works with the global energy of the 11, allows you the opportunity to take your life to the next level. You can learn how to maximize your connection to the extra spiritual energy you will experience this year, and bring heaven to earth in your own unique way. In the 11 year you need to stay grounded and also be aware when you are focusing too much on trying to find something outside the self to feel whole. In 2018 keep your eyes focused beyond the physical world, embrace new creative expressions of the divine, while staying practical and rooted in the physical body. Each one of us has a unique personal year number that is influenced by the global 11 energy of 2018. Your personal year number shows you the specific way in which you can experience deeper spiritual and physical connections this year. When you understand how this works, then you can align your birthchart energy and the global trends. Calculating your personal year number is simple. Just follow the simple steps below. Step 1 (Month + Day) : Add the month you were born with the day you were born. For each month you simply replace the month with its appropriate number. Once you have your month number then you add that to the day you were born. For example, if you were born on October 23, then you would add 10 (the number for October) with 23. So, for a person born on October 23 the number of the day plus the month is 6. Step 2 (Month + Day + 2018): Add the month + day number to the current year number. For example, we already know that 2018 is an 11 year. To get this number we add all the numbers together: 2 + 0 + 1 + 8 = 11..
Then we simply take the 11 and add that to our Month + Day Number. Continuing the example above we add 11 + 6 = 17. In the Numbers Lab System we reduce all numbers down to 11 or less, so we reduce the 17 by adding the numbers together; 1 + 7 = 8. So, for the person born in October 23 the personal year number for 2018 is a 8. Try this with your own birthdate numbers and see how you do. Below is a list of the Personal Year Number, starting with the 11, and how it can collaborate or conflict with the global energy of the 11 in 2018. Note there is a key concept, archetype energy, and insights into how to express your best in 2018. 11 and 11 – Double Divine Connection – Archetype of the Spiritual Guru & Teacher –relationships will be important this year; keep in mind the most important relationship is the one with the universe (spirituality and god). Keep a solid spiritual practice. You can experience real spiritual abundance this year if you embrace your connection to all things and express that in every area of your life. It is a good time to teach spiritual things and also access the heavens to discover new artistic expression; writing, singing, music, art. Be aware of desires to find a soul mate or find wholeness outside the self…these will lead you astray. 3 and 11 – Conscious Flow – Archetype of the Divine Artist and Creative – You may loose focus this year, feel like a flag in the wind, and just want to let things flow. It is not a bad year to do so, especially if you flow with the divine. The heaven are your best friend this year. It is not a good year to make plans, but make decisions by first connecting to the divine. This is the year for you to have fun, access the inner child, stay positive and laugh often. Take on a service project that allows you to be a part of your community. It is also a good time to connect with spiritual communities. Ultimately it is a year for brining the heaven to earth through creative means so take up art, writing or music and see what happens. 4 and 11 – Meditation Mastery – Archetype of the Holy Grail – you have the power to make plans that are inspired by the heavens, but to build something great you must first empty your cup and sit in stillness, then let the heavens fill you up. Stay observant, non-judgmental, and think logical in your decision making. Make a plan and then offer it up to something greater; day by day and month by month the plan will materialize. Meditate often this year, especially when you need perspective to make the right decision. 5 and 11 – Balance Heaven and Earth– Archetype of the Spiritual Athlete – this is the year to be in your body, get physically active, take on a daily physical practice. This will help you get your life in the right gear and the build momentum necessary to get to where you want to go and to make the changes you want. By marrying the physical practices with a spiritual focus you can accomplish even more in life. Take a spiritual journey to a destination you have always desired to visit or spend time doing yoga at an ashram. Network in spiritual circles and teach spiritual things this year. Maybe use the 5 energy to get on stage and shine like a star – the heavens will amplify the performance. Overall, just watch your balance and pay attention to the body as it will be a good teacher this year. 6 and 11 – Holy Heart – Archetype of the monk or nun in the temple – Stay heart centered, your heart has the power to express the emotions of the heavens. Make your home a temple, a place that you would imagine yourself being the priest or priestess of. Be aware that the commitments you make this year should have a spiritual, heart-centered focus. Take some time to dance this year and get into nature, especially when faced with big decisions or challenges. And if you are in need of healing, then ask the heavens for a miracle. 7 and 11 – Voice of the Heavens – Archetype of the Divine Messenger – Your presence and voice is an expression of the divine. Write, speak and sing – share your thoughts and feelings with others, when you feel safe to do so. Make sure you are also taking the time to be a hermit; go take a retreat in a spiritual place and discover what you really want to say and share. Process your mental thoughts alone. Your voice is your means of bringing the heavens to the earth so make sure you share your thoughts with others. Make solid boundaries this year. It is a great time to write the book you have always wanted, or start singing open mic nights and karaoke or get on state and share a message with the world. 8 and 11 – Power of Heaven. Archetype of the Spiritual General – take charge, get things done, you have unlimited energy and even when you run out you can access the heavens for more. Your mastery of spiritual abundance and spiritual energy is important this year. It is a great year to use your abundance to support a spiritual cause. There is aways a risk for burn out in an 8 year, so get in the right gear by staying physically active and having a consistent breath practice. Take three deep breaths with eyes toward the heavens before making any big decision or speaking from your emotions. 9 and 11 – Calm Presence. Archetype of the Spiritual Master – you are ending a cycle and at times must surrender completely to the heavens. Free yourself from the past and move forward. But don’t start new things and don’t push old things away – stay non-attached and let things come and go. Accept what is. Focus on mastering what you are already doing in your life. Take on physical and mental practices that challenge you to stay calm. Spend time with individuals that have a spiritual mastery that you aspire to embody. 10 and 11 – Seed of Heaven Sprouted – Archetype of the Spiritual Leader. This is a great time to start or do that thing you have always wanted, especially things that have a spiritual focus. Make sure you follow through and now that whatever you start is part of a bigger purpose than the self. If you take up leadership roles this year, others will follow as long as you are taking your lead from the heavens. Wear white to let your soul shine. This is your time to lead yourself and other, into a new and more spiritual future. 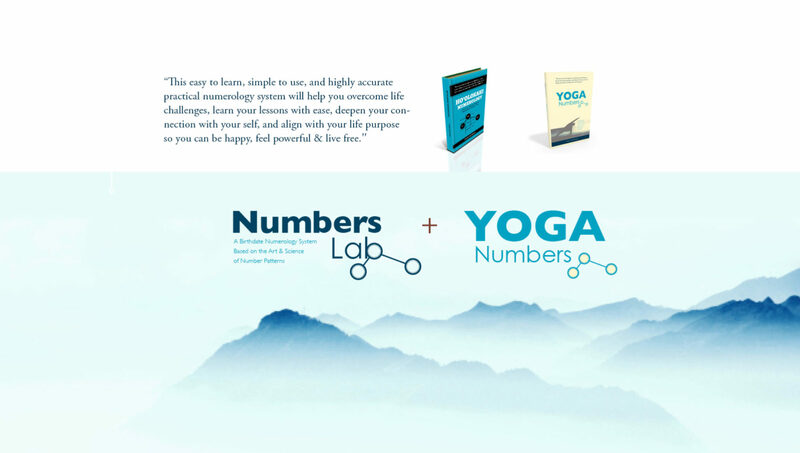 Interested in a Private Consultation or want to bring the Numbers Lab + Yoga Numbers Training to your city?